Richard Strauss’s Duet-Concertino has been more the kind of work appreciated by a few connoisseurs when compared to the popularity gained by other late works such as the Oboe Concerto or the Four Last Songs. Laurence Perkins points out in his excellent booklet note that it can best be listened too as a kind of tone-poem, the narrative based loosely around Beauty and the Beast. Strauss left no synopsis so our imaginations are given plenty of room to speculate, but some elements such as the bear’s leitmotief – a rising major 7th interval – and its clumsy dance early on, seem clear enough. The booklet gives 1947 as its date of completion though other sources put this at 1948. 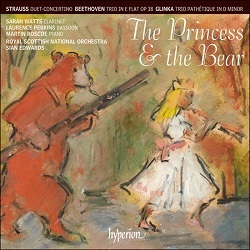 Either way, the end of WWII and the problems this brought in Strauss’s life was still raw in the memory, and there is a further suggestion that this tale of incompatible characters and their ultimate resolution of their differences was one that the composer would have seen as attractively symbolic. Despite suggestions of neglect, the Duet-Concertino has quite a few alternative recordings, including the Decca Eloquence re-release of the recording by clarinettist Dmitri Ashkenazy and bassoonist Kim Walker with the Leipzig Gewandhaus Orchestra conducted by Herbert Blomstedt (review). This is more heart-on-sleeve from the orchestra than with the RSNO, the strings of which take more of a back seat in the first movement – that, or the balance of the recording puts them a little further away. The recording on the Quantum label with Ensemble Jean Wiéner was considered a bit too lightweight in the orchestra by Bobb Briggs (review), and this is a criticism that could be levelled at this Hyperion recording, Strauss’s luscious and detailed orchestral lines sounding rather generalised behind the sound of the two wind players. Sarah Watts and Laurence Perkins play superbly of course, though their interactions could carry a bit more narrative daring, another aspect evidenced in Herbert Blomstedt’s recording. The clarinet certainly has the best of the balance, and could have been taken down just a notch or two. Beethoven’s Trio in E flat major Op. 38 is descended from his Septet Op.20, a piece that had become so popular that numerous arrangements for smaller forces were made. The first edition of Beethoven’s own arrangement has commercially pragmatic options for instrumentation including violin instead of clarinet, and the bassoon part given to the more commonly played cello. Putting in bassoon rather than cello takes us a step closer towards the septet original but recordings with this option are hard to find. We are fortunate indeed to have such an excellent performance with this trio, pianist Martin Roscoe sensitive as well as characterful and witty, the dynamics of the whole blending into something that becomes grander than the sum of its parts. The Adagio cantabile second movement has more of an ‘andante’ feel, but Beethoven isn’t plumbing any particular depths here and I prefer this to artificial lingering. The popularity of this work is and was always due to its bright and entertaining qualities, and these shine through in this delightful performance from every bar, with even the more dramatic moments such as the opening of the finale given a tongue-in-cheek flavour thanks to the bassoon. Glinka’s Trio pathétique comes from a period in which Italian influences were stronger than the influential Russian nationalist style he would later adopt. The operatic flavour is the work is apparent from the outset, its emotional darkness assumed to be connected with the break-up of a relationship at the same time. The heartfelt aria of the third movement is at the centre of this painful state of affairs, but the dramas and stresses of the outer movements give the work a restless character that is superbly portrayed in this performance. There are more overtly dramatic recordings to be found, such as the Borodin Trio on Chandos CHAN8477 arranged for violin, cello and piano, but with a more expansive tempo in the first movement the promise of the opening isn’t quite sustained further along. The CPO has a more recent recording in their all-Glinka programme (7778712), but I find the musicians in this Hyperion recording to have more inner sparkle. With its more chamber-music feel this may not be your perfect Duet-Concertino, but with attractive playing from all concerned and an unusual and appealing programme this Hyperion release is easy to recommend.